Communism: 100 years on from the Russian Revolution, how did it all come about? Home / Articles / Communism: 100 years on from the Russian Revolution, how did it all come about? The idea of equality and common ownership of property has always been around. There were communes in the English civil war and radical communities in Germany around about the same time. Communism really came to the fore in the mid 19th century with the post-industrial revolution. It created a new urban working class. It was also a product of economic and political philosophy (Marx was the founder but it didn’t spring from nowhere). 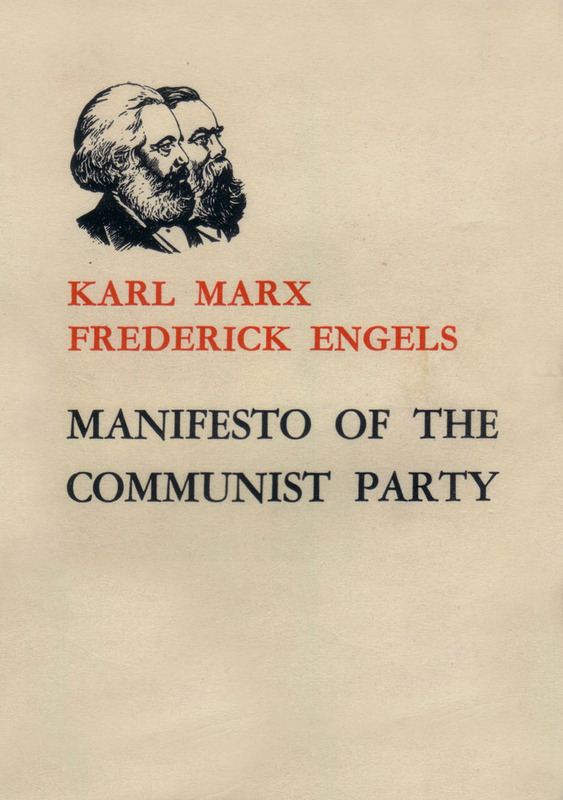 The term communism took a big leap forward in 1848 with the ‘Communist Manifesto’. 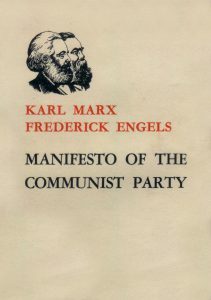 Marx wrote the Communist Manifesto in 1892 when Marx was living in London. 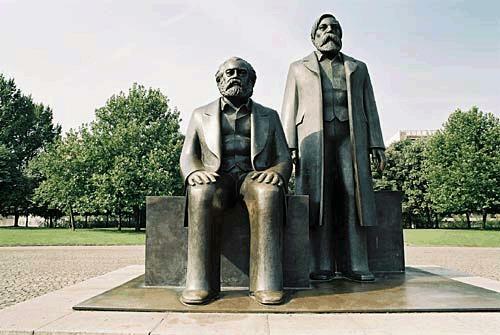 Engels and Marx had developed a partnership over a number of years. Engels was a capitalist (the son of an industrialist with factories in Manchester). He was Marx’s financial sponsor when Marx was in London. Marx was an intellectual and a journalist. Engels was the more practical one with first hand experience: he had been to factories and had the money to sponsor Marx’s writings. Engels spurred Marx on and encouraged him to finish things; something every intellectual needs. Marx argued that within the free-market system there were forces that would eventually destabilise and undermine the capitalist system. Specifically, Marx believed that as wealth in the form of capital became more concentrated in a few hands and wages stagnated, the working class would revolt against this injustice and eventually overturn the capitalistic rich. Marx and his fellow thinker Friedrich Engels developed the idea of communism, the theory of a society built on the idea that the means of production, everything from natural resources to factories, should be owned equally by everyone; not by private individuals or companies. Marx and Engels wrote in the Communist Manifesto that “the history of all hitherto existing society is the history of class struggles,” and argued that under communism class struggle would be abolished by establishing the final and total victory of the proletariat: the working class (David Linden, ‘The Road to Serfdom’). A Jewish Russian intellectual, journalist and revolutionary. In 1911 he was in Vienna and floating around at the same time you had: Trotsky, Hitler, Freud and Lenin; all of whom formed part of the Viennese intellectual society that hung around in Viennese coffee shops discussing things of an intellectual nature. Trotsky had been exiled by the Tsar’s regime some time after the 1905 revolution because he was a revolutionary (being Jewish probably didn’t help either). In the civil war the White Army were very anti-semitic and they accused the Bolsheviks of being in line with the Jews (who had also been oppressed in Tsarist Russia). Trotsky had been a Menshevik and only went over to the Bolsheviks at a later stage: some time in 1917. He became the Bolshevik war co-ordinator and was good at plotting the war of survival against the White Army and the intervention powers (UK, Germany and the Americans). He managed to see them all off with his ad hoc outfit, the Red Army, who were a revolutionary army, not a proper one: most of the old Russian Army would not have supported the revolution. As a result of Trotsky’s efforts, the Red Army won the civil war. Trotsky was a genius but his victory was carried out by brute methods. The suppression and discontent amongst the civilian population and the workers was merciless. Trotsky remained in the Russian leadership until the late 1920s but Stalin hated him and managed to drive him out. Trotsky had a tendency to rub people up the wrong way. Furthermore, there was a big difference in his grand strategy: Trotsky believed that you needed to broaden the revolution and that it would fail if it was confined to Russia. Lenin didn’t really say anything about this. Stalin did however: he said that you should first control Russia, consolidate communist power there and worry about the rest of the world later. 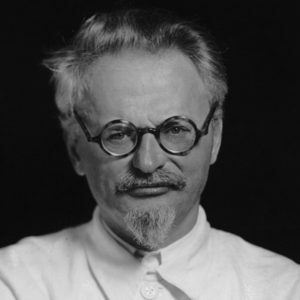 Trotsky lost the internal battles, went into exile and in 1940, was assassinated by a Stalinist agent. Lenin died in 1924. He was from the upper middle class and was an intellectual. His family were therefore not poor as otherwise he would not have had the luxury of education. 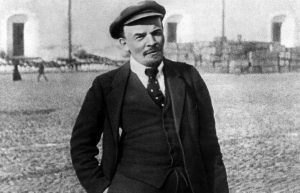 Lenin was the leader of the Bolshevik faction when the Socialist party split into Mensheviks and Bolsheviks. He spent a lot of time in exile. Lenin (along with Stalin and Trotsky at various periods), had been exiled to Siberia under the Tsar. Under the Tsar’s rule, it was much easier to escape from exile than it was under the gulags that existed under Stalin. By the time 1917 came around, Lenin was in exile in Switzerland. The Germans allowed him passage through Germany, then Finland, to get back to Russia (via St Petersburg). This obviously annoyed provisional government who had come to power shortly after the February Revolution. When Lenin returned, he planned and organised revolts. His plans suffered a bit of a set back when some of his supporters tried to have the revolution in July 1917. Lenin then went back to Finland for a short time because the police were after him. (He was in Finland because the border between Finland and Russia was very close to St Petersburg). He later returned to organise the October 1917 revolution. Revolution was in St Petersburg, which had bee renamed Petrograd by the Tsar under the later stages of his rule. (In 1991 it went back to being called St Petersburg). Lenin led the government of the October Revolution until he died in 1924. (At this time it became the Soviet Government as the government was based on the authority of the Soviet workers’ councils). Incidentally, Lenin’s brother was executed in 1887, aged only 21, for an attempt to assassinate the Tsar. He was a communist political activist. This no doubt had an effect on the young Lenin. After Lenin died, there was a collective leadership for a short while until Stalin came to power. Putin: ‘Whatever anyone may say about him, victory was achieved’. Unlike Mussolini and Hitler, Stalin wasn’t a gifted public speaker. The hypnotic power of suggestion was concentrated in his writing. He was General Secretary of the Communist Party that had previously been regarded as a dull, bureaucratic job. Stalin however gradually managed to concentrate power in that role. So power shifted from the state to the party and within the party, it became increasingly dictatorial power under Stalin and by 1929/1930, Stalin was more or less in control of the Soviet Union. The basic elements of the Stalinist regime – the one-party state, the system of terror and the cult of the leader – were in place by 1924. Visibly, Stalin was nothing to look at. As a child he had had small pox that left his face pock marked. One arm was shorter than the other as a result of a childhood accident, the second and third toes of his left foot were joined together, he had bad teeth from many years spent in exile and he was only 5ft 3 inches (although special shoes gave him an extra inch or two). His father was an alcoholic shoemaker who made shoes for the Russian army. The father beat his wife and Stalin. He had two older brothers who both died in infancy. Stalin only started to speak Russian aged 9. Prior to that he spoke Georgian only. He was from a rough town in Georgia that had a lot of street brawling. In February 1892 as a young boy (Stalin was born in 1879), he witnessed the public hanging of two criminals. It was a botched hanging and Stalin came away from it hating the Tsarist regime that ordered the executions. At school Stalin did very well. His mother sent him to a church school from which he graduated two years early. He was awarded a scholarship to study at the Seminary from where he was expelled in 1899 for his Marxist leanings. He joined the Russian Social Democratic Labour party, the RSDLP and whilst part of that, helped to stir unrest by organising strikes and writing anti-Tsarist articles. For some of these activities he was exiled; one time being in 1902, for a strike he had helped to organise. For this he was sent to prison months and then exiled to Siberia: plenty of time to further foment his hatred for the monarchical regime. It was not the only time that Stalin was arrested and exiled: between 1902 and 1913, he was arrested 6 times. Each time he escaped and returned. Escaping from exile at the time was a far easier task than it was in the Siberian gulags established by Stalin later on. In 1913 he was exiled to Siberia for a further 4 years. In 1903 it split into two factions: the Bolsheviks and the Mensheviks. Stalin aligned himself with the Bolsheviks as he was a fan of Lenin. Whilst in Georgia Stalin worked at undermining the Mensheviks. He also helped to raise funds for the Bolshevik party (by robbing banks), and this brought him to the attention of Lenin. ‘The cause of the split was seemingly trivial: the definition of Party membership. Lenin wanted all members to be activists in the Party’s organization, whereas Martov thought that anyone who agreed with the Party’s manifesto should be admitted as a member. Beneath the surface of this dispute lay two opposing views of what the Party ought to be: a military-revolutionary vanguard (tightly controlled by a leader such as Lenin) or a broad-based party in the Western parliamentary style (with a looser style of leadership). Lenin won a slender majority in the vote on this issue, enabling his faction to call themselves the ‘Bolsheviks’ (‘Majoritarians’) and their opponents the ‘Mensheviks’ (‘Minoritarians’)’. Stalin married for the first time in 1906 and had a son. He was away a great deal and rarely saw them. Shortly after his wife died of typhus at the young age of 22. Stalin was devastated and is known to have said that she had softened his heart of stone and the last of his warm feelings of humanity died with her. After her death his son was brought up by his wife’s family and Stalin barely saw him. In the event that you might be feeling sorry for Stalin, don’t: he ordered the execution of much of her family later on down the line; including her brother in 1941. Her brother had been an old school friend of Stalin’s who had in fact introduced Stalin to his sister 35 years earlier. In 1911, Stalin fathered a son by his landlady whilst living in an isolated village. The son had no contact with his father and was forced to sign a document in 1932 in which he was never allowed to reveal the identity of his father. 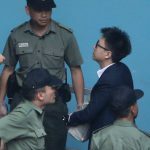 In 1947 the son was arrested and accused of being a US spy but was later released, probably on his father’s orders. In 1919 Stalin married again: she, Nadja, was 18 to his 40. Apparently Stalin had known Nadja as a young girl it is even said that he saved her from drowning when she was 4 years old. Stalin may have had an affair with the mother at the time. Stalin had a son in 1921, Vasily, and a daughter in 1926, Svetlana, with Nadja. Sadly Nadja shot herself in 1932 when the children were still young as she suffered from depression. 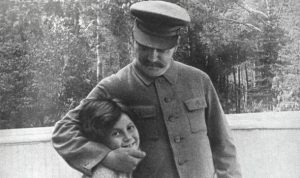 Stalin was strict with his son but is said to have adored his daughter. Whilst living in Petrograd with Nadja, Stalin took over the editorship of the Soviet newspaper ‘Pravda’. He used the newspaper to criticise the then provisional government who he criticised as being no better than the autocratic Tsar. The Bolsheviks at the time of the provisional government were a minority party, even within the Soviet socialists. Stalin tried to improve the Bolshevik party’s standing and was therefore very cooperative with the provisional government, something that Lenin later on criticised him for. Once the Red Army had reconquered Russia’s old Imperial borderlands in Ukraine, Central Asia and the Caucasus, Stalin, as the Commissar of Nationalities, proposed that the non-Russian republics should join Russia as autonomous regions, thereby depriving them of the right to secede from the union. Lenin believed the non-Russian republics should have this right as sovereign republics because he thought they would want to be a part of the Soviet federation in any case. As far as Lenin saw it, the revolution trumped all national interests. Lenin called Stalin a ‘rascal and a tyrant’ who could only bully and subjugate small nations, whereas what was needed was ‘profound caution, sensitivity, and a readiness to compromise’ with their legitimate national aspirations. In his later years, Lenin came to resent his promotion of Stalin but by the time he realised, it was too late to do anything about it. As a result of Lenin’s illness, Stalin got his way. The founding Treaty of the Soviet Union was centralist in character, allowing the republics to develop cultural forms of ‘nationhood’ within a political framework set by the Communist Party of the Soviet Union (CPSU) in Moscow. The Politburo purged the Georgian Bolsheviks as ‘national deviationists’ – a label Stalin would use against many leaders in the non-Russian regions in the years to come. The purges of ethnic minorities that were undertaken during Stalin’s time are well documented. (The above taken from Orlando Figes, ‘Revolutionary Russia, 1891-1991: A Pelican Introduction’ (p. 175). Penguin Books Ltd. Kindle Edition). ‘He is gifted with practicality, a strong will, and persistence in carrying out his aims. His political horizon is restricted, his theoretical equipment primitive … His mind is stubbornly empirical and devoid of creative imagination’. Orlando Figes, ‘Revolutionary Russia, 1891-1991: A Pelican Introduction’ (p. 172). Penguin Books Ltd. Kindle Edition. The above are just some personal facts that I found of interest when reading about Stalin: the rest, when he came to power, is well known and frequently written about in history. I have done a separate timeline on the history of the Russian Revolution in a separate article and listed below some good resources to use should you want to read in more depth. Linden, David, ‘The Road to Serfdom’ (The Macat Library) Taylor and Francis. Kindle Edition. http://www.historyinanhour.com/2011/12/04/the-sad-lives-and-demise-of-stalin’s-sons/ This is an excellent book Rupert Colley. You can buy it on audible.co.uk at very little cost and in chapters, in an hour, the narrator Jonathan Keeble recites the life of Stalin. It is very easy listening. Academically, Robert Service and Richard Sakwa are the two excellent sources and both write with a great deal of knowledge on the subject. Furthermore, the texts are very accessible. 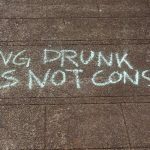 Some recent articles written by him. In this book you can read in detail about what happened under Stalin and the leaders that came after him.